The first family returns to Washington after a 15-day vacation. 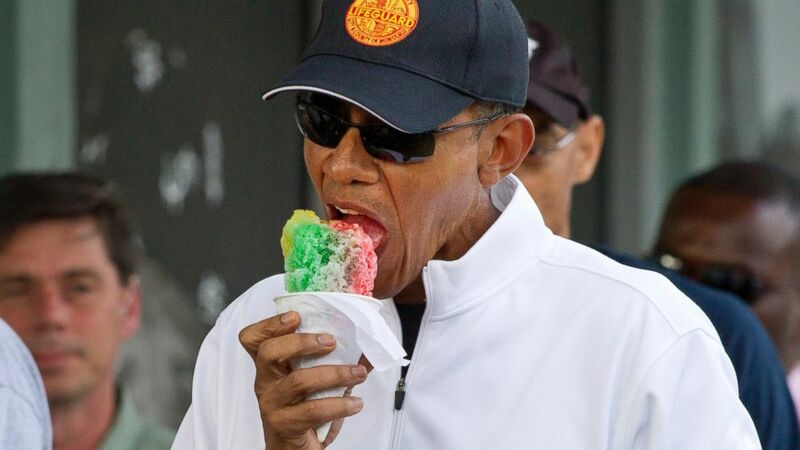 camera (Jacquelyn Martin/AP Photo) President Barack Obama eats shave ice with daughter Malia at Island Snow, Thursday, Jan. 1, 2015, in Kailua, in Hawaii during the Obama family vacation. It was a long year for President Obama (see: ISIS, Ebola, Democrats' staggering loss in the 2014 midterms) -- and the commander-in-chief is in serious need of a little R&R. 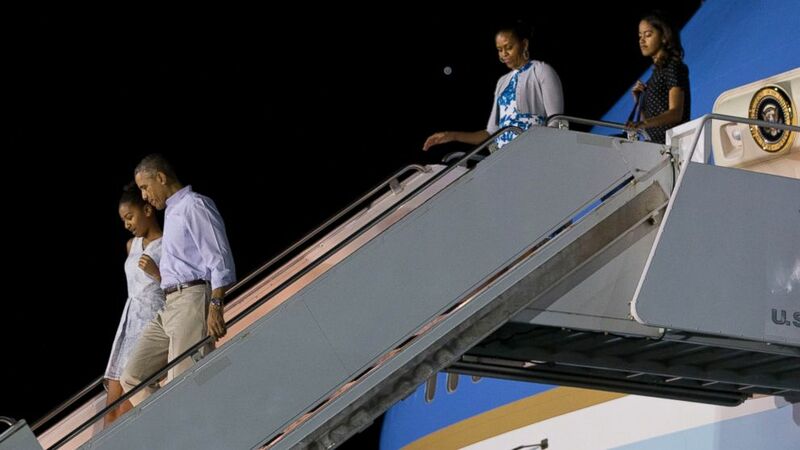 Obama and family departed on Dec. 19 for a 16-day holiday in his native state, Hawaii. It was their sixth Oahu vacation since the president took office. Of course, there's no such thing as a work-free vacation for a sitting president, but Obama did tell reporters he hoped the trip would be a "quiet time-out" to enjoy the family. ABC News was along for the ride, and we'll give you a behind-the-scenes look at what it's like on an Obama vacation. President Obama and daughters Sasha and Malia paid a surprise afternoon visit to the Kailua home of Pearl Jam rocker Eddie Vedder. It turns out the Obamas and Vedder are relative neighbors on Oahu, since the first family also rents a place nearby on the north shore. Vedder was a prominent supporter of Obama’s two election campaigns. In September 2012, he headlined a $20,000-per-person fundraiser in Tampa, Fla., which the president attended and helped raise close to $2 million. After Vedder performed an acoustic set at the event, he famously broke out a Hawaiian-made ukulele and joked, "It's got a little birth certificate right in there!” – a reference to those widely refuted claims that Obama was born overseas. The White House did not allow press coverage of today's visit. Earlier in the afternoon, the Obamas stopped by the Punchbowl cemetery to see their maternal grandfather and paid a visit to the president's half-sister Maya Soetoro-Ng. No word on why First Lady Michelle Obama did not join. The Obama family is soaking up the Hawaiian sun and surf for one final day before returning to Washington. All told, the president has played 9 rounds of golf, hit the beach 5 times, went on a snorkeling expedition, took a hike into the mountains, attended a luau with friends, and spent a dozen hours at the gym. Air Force One was scheduled to depart Joint Base Pearl Harbor-Hickam late Saturday evening Hawaiian time, returning the family to the White House by midday Sunday. Before they board the plane for the red-eye flight, they'll enjoy one last dinner out on the island. No word from the White House on the restaurant of choice, but if past years are any guide they will close out the holiday with steaks at Buzz's Original Steakhouse in Lanikai. A brilliant rainbow appeared Friday over the seaside Kailua subdivision where Obama has been vacationing, but it wasn't a lucky day for one of his neighbors. Cheyne Todani, who has stood along the president's motorcade route for days holding a sign, wanted Obama to stop and say hello. "You are my son's hero. I promised him I'll try my best to get his ball signed," it read. A basketball rested on the ground by his feet. 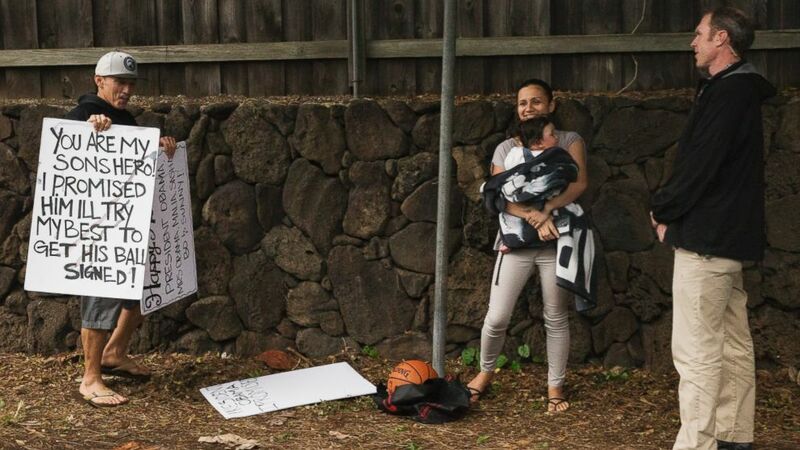 (Jacquelyn Martin/AP Photo) President Barack Obama's motorcade returns from golf as Cheyne Todani, left, holds a sign asking the president to sign a basketball for his son, Friday, Jan. 2, 2015, in Kailua, Hawaii. But as Obama's black armored SUV approached, and the rainbow coincidentally disappeared, it just rolled on by with out stopping. Todani, his wife Miriam Fry and their 7-month-old daughter Cienna looked on as he passed. The president hit the gym and later played a round of golf at Marine Corps Base Hawaii. For dinner, the first family went to the upscale Japanese restaurant Nobu in Waikiki. The first dinner of 2015 for the first couple was a three-hour, multi-course meal at the exclusive Vintage Cave of Waikiki, where the prix fixe menu starts at $295 per person, according to local food blogs. The restaurant also offers $500,000 "memberships," which includes a private wine cellar, discount on meals and an investment stake in the restaurant. Its website says "gifted masters of the culinary arts" prepare bites to please "the most discerning palate." "Secure in the natural embrace of the cave-like environment, guests are encouraged to relax, 'hit reset' and escape the ordinary," the site says. The White House said it was the Obamas' first visit to the restaurant. No word on whether they became members. 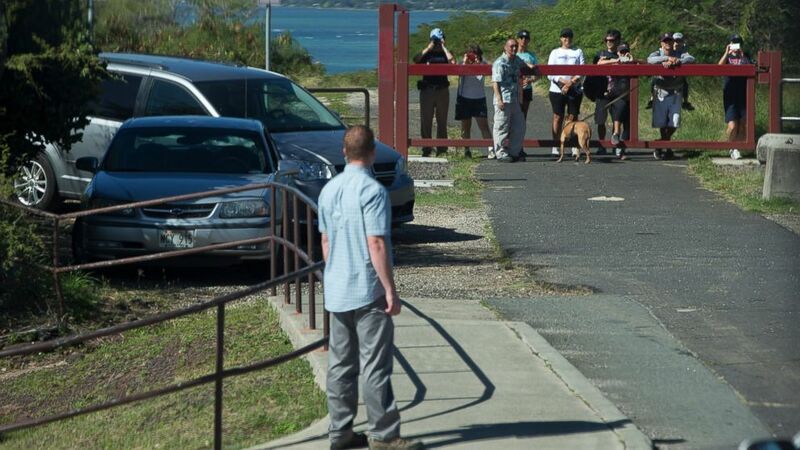 (Jacquelyn Martin/AP Photo) People vie to see past a secret service agent for a glimpse of the motorcade taking President Barack Obama and the first family to Hanauma Bay Nature Preserve where they will go snorkeling, according to the White House, Jan. 1, 2015, on the island of Oahu in Hawaii during the Obama family vacation. Earlier on New Year's Day, the presidential entourage went snorkeling in beautiful Hanauma Bay, which they had entirely to themselves for four and a half hours. Normally the beach and park would be packed with tourists on a holiday. Aides who were also in the waters tell ABC News they were tranquil and fish-filled. While POTUS swam, Coast Guard ships patrolled offshore and Secret Service agents blanketed the hills overlooking the sea. The outing's security measures illustrate the extensive (and expensive) steps to protect presidents when they recreate. After snorkeling, the Obamas stopped for shave ice at Island Snow, a local joint that's become a family favorite. The president, dressed casually in beachwear, enjoyed a melon/lilikoi/cherry concoction next to his daughter Malia as they mingled with other patrons. 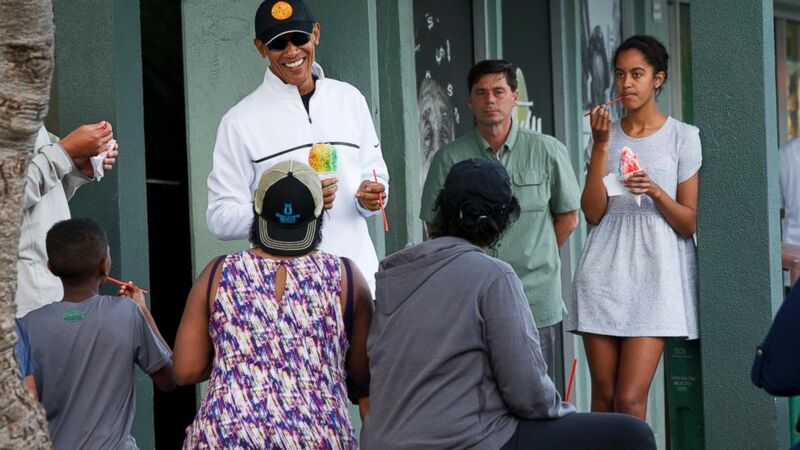 (Jacquelyn Martin/AP Photo) President Barack Obama eats shave ice with daughter Malia, at right, at Island Snow, Jan. 1, 2015, in Kailua, in Hawaii during the Obama family vacation. Pool reporter Carol Lee of the Wall Street Journal, who was on scene, noted that one in particular stood out in the crowd: She "had a large parrot on her shoulder and told pool that her husband said he'd give her $1,500 if she got POTUS to hold the parrot on his shoulder. That did not happen." President Obama closed out 2014 the same way he began the year: on the golf course with his old high school pals. After the round, Obama spent the evening at his rental home in Kailua, Hawaii, with family and friends, the White House said. He remained out of sight of reporters' cameras all day, but members of the traveling press pool caught a glimpse of his entourage waiting outside the clubhouse at the Klipper golf course on Marine Corps Base Hawaii. All told, Obama completed 54 golf outings this year and 214 since taking office in 2009, according to unofficial White House press corps statistician Mark Knoller of CBS. Meanwhile, on New Year's Eve day, first lady Michelle Obama and daughters Sasha and Malia were off on another adventure, perhaps at the beach for some body surfing. 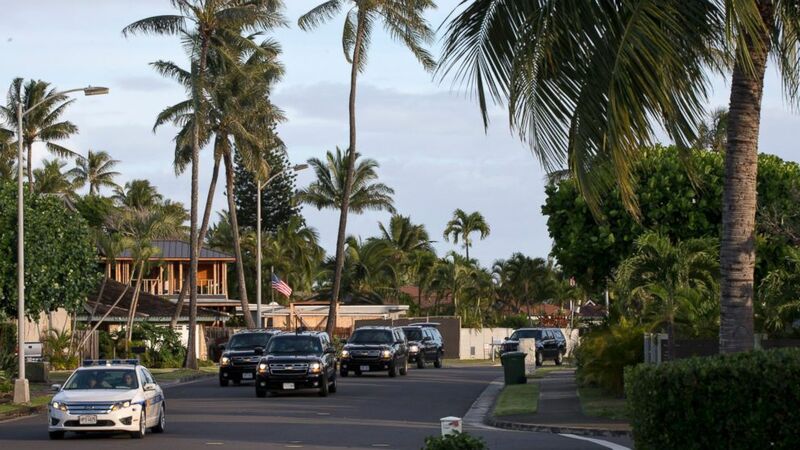 (Jacquelyn Martin/AP Photo) The motorcade carrying President Obama drives to the gym on Dec. 31, 2014, from his rental home in Kailua, Hawaii, during the Obama family vacation. It's no secret that being President of the United States is a 24/7 gig with no opportunity to fully unplug or unwind. And today, President Obama demonstrated that even in paradise duty calls. The Obama family kicked off their second week of vacation in paradise with an afternoon at the beach and dinner at Alan Wong's, one of the most highly-regarded restaurants in Hawaii. The president, first lady and friends dined for more than two and a half hours, according to pool reporters on scene. Wong's menu features regional cuisine prepared with modern flair, including specialties ginger crusted onaga, pan-steamed opakapaka, and macadamia nut-coconut crusted lamb chops. No word on what the Obamas ordered. While they were eating, White House spokesman Eric Schultz told reporters that Obama had been briefed on the disappearance of Air Asia Flight 8501 and that administration officials were closely monitoring the situation. President Obama returned to his routines after the Christmas holiday, heading to the gym - his fourth visit this trip - before heading to the beach with his family and friends - his third visit this trip. He and the family parted ways shortly after midday for the president to get in a long round of golf at Royal Hawaiian Golf Club, his fifth round, for those keeping track. Scenes from a pool van part 2. Look familiar? ABC News actually spied the president for about two seconds at the golf course when he made a quick stop in the clubhouse where the press pool was holding during his 5 and a half hour round of golf. It was too quick and unexpected to get a photo but he was dressed in, well, golf attire. As usual, no scores were released, but he had some regulars in his party: Greg Orme, Bobby Titcomb and Mike Ramos. New golf location but no POTUS in this view. With the exception of that brief sighting, it was mostly motorcade rides and pretty views. Late this afternoon, as promised, the Obamas made the quick ride over to Marine Corps Base Hawaii (site of POTUS' golfing, bowling, workouts and sometimes beaching) to say thank you to military families. The President has made this trip an annual event and he was joined by Mrs. Obama. "So on a day when we celebrate the Prince of Peace and many of us count our blessings, one of the greatest blessings we have is the extraordinary dedication and sacrifices you all make," he told the troops. "We could not be more thankful. I know I speak for everyone in the entire country when I say, we salute you." (Jacquelyn Martin/AP Photo) President Barack Obama, with first lady Michelle Obama, points toward a child in the audience as he greets troops and their families on Christmas Day, Dec. 25, 2014, at Marine Corps Base Hawaii in Kaneohe Bay, Hawaii. Obama pointed out that the war in Afghanistan is due to come to a close by year's end. "We've been in continuous war now for over 13 years. Next week we will be ending our combat mission in Afghanistan. Because of the extraordinary service of the men and women in the Armed Forces, Afghanistan has a chance to rebuild its own country. We are safer. It's not going to be a source of terrorist attacks again. And we still have some very difficult missions around the world, including in Iraq. We still have folks in Afghanistan helping the Afghan security forces. We have people helping to deal with Ebola in Africa and obviously we have folks stationed all around the world. But the world is better, it's safer, it's more peaceful, It's more prosperous and our homeland is protected because of you and the sacrifices each and every day," he said. Before the Obamas went to the base, the family spent about three hours out at the Bellows Air Force Station for a Christmas beach day. This is the second time he's been to that beach this trip. And no gym today -- but, hey, it's Christmas. Mrs. Obama was also apparently in the #TBT spirit, posting a throwback photo to her Instagram account of herself and husband. The undated photo was captioned, "Merry Christmas!" and shows the smiling couple standing next to a decorated tree. For the first time since President Obama arrived at his vacation home five days ago, the press finally got a brief, up-close interaction with him today – what journalists call a "pool spray." It happened on the 18th green of the Kaneohe Klipper Golf Course (his fourth round this trip, for those keeping count) while he golfed with a new partner: Malaysian Prime Minister Najib Razak. (Jacquelyn Martin/AP Photo) President Barack Obama plays golf with Malaysian Prime Minister Najib Razak, right, Wednesday, Dec. 24, 2014, at Marine Corps Base Hawaii's Kaneohe Klipper Golf Course in Kaneohe, Hawaii during the Obama family vacation. One more from pooler Lee Ross. Asked if he planned on watching the movie "The Interview," which was released online today, Obama smiled and said, "I'm glad it's being released," according to a pool report from Wall Street Journal writer Carol Lee. Obama also warned press pool members against imbibing certain drinks while in Hawaii. "Be careful about those fruity drinks," he said. "They might have a little kick." The press pool reported that Obama missed a 15-foot putt to the left and Najib missed his putt, too. Obama patted him on the shoulder and told him it was a nice job anyway. Not too far away from the course, Mrs. Obama participated in North American Aerospace Defense Command's "Santa Tracker" program for the fifth year in a row, the White House said. As part of the annual program, the First Lady took calls from kids and kept them updated on where Santa was - amongst other things. One child named Cole asked how President Obama was. "The President is good," Mrs. Obama replied. "He is having a meeting right now with a prime minister somewhere. But he is here in Hawaii. We're here with our family, and everyone is excited for Christmas tomorrow. So I will tell him that you asked how he is doing. I know that he wishes you and your family a very merry Christmas." The common theme in most calls was urging kids to eat veggies and actually go to sleep so Santa can do his work. For the record: President Obama made it to the gym today, making it three days in a row. With the rain cleared out, President Obama promptly moved back outdoors for Day Four of his 2014 vacation. 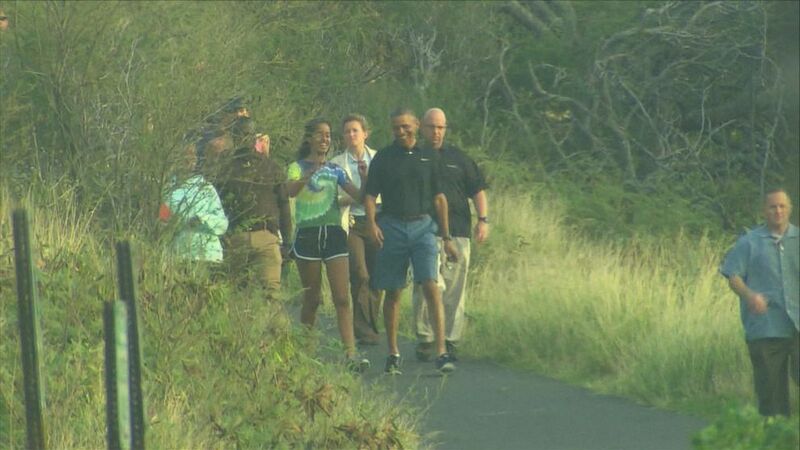 The president surprised hikers on Tues. Dec. 23 during a hike in Oahu with his daughter, Malia, and friends. The president started off with an hour-long trip to the gym—two days in a row, Mr. President. Keep it up! He then opted for a 5-hour round of golf at the Kaneohe Klipper course (again). Along for the round were aides and buddies: Greg Orme, Bobby Titcomb & Joe Paulsen. But Obama wasn't done. An hour later his motorcade made its way along scenic oceanside Kalanianaole Highway to eventually arrive at Makapu'u Point Lighthouse trail, where he and daughter Malia and "friends" went for a hike. Just met the president! Shook hands and said #merrychristmas #nobig #Obama actually very cool experience ? And an eagle-eyed press pool videographer managed to get some shots of Obama on the trail from some distance (where they usually keep us). In one scene Obama, clad in a black polo-style shirt, blue shorts and black sneakers, appears to be giving a small child a piggyback ride, though the press pool advises the White House isn't likely to reveal who the pint-sized ride-hitcher is. Obama finished up his hike around 5:15 pm local time and headed back to his vacation rental. Unfortunately, the press pool wasn't able to witness the terminus of that motorcade movement. The trusty old pool bus had a blowout and was stranded on the side of Kalanianaole Highway. White House aides swear the president made it back to the house safe and sound. @GarciaJon @kevinliptakcnn Could be worse. You could be on the Jersey Turnpike. Day Four hasn't been all play for President Obama. There bits of news here and there to which the White House needed to respond to -- and they did. "The President applauds Sony's decision to authorize screenings of the film. As the President made clear, we are a country that believes in free speech, and the right of artistic expression. The decision made by Sony and participating theaters allows people to make their own choices about the film, and we welcome that outcome." Then came word that a Washington, DC judge had tossed out a lawsuit that sought scuttle Obama's executive actions on immigration. Schultz said the White House was vindicated. "Judge Howell's decision today confirms what the Department of Justice and scholars throughout the country have been saying all along: the President's executive actions on immigration are lawful," Schultz said in a statement. "The Supreme Court and Congress have made clear that federal officials can set priorities in enforcing our immigration laws, and the actions announced by the President are consistent with those taken by administrations of both parties for the last half century. The court correctly dismissed Sheriff Arpaio's lawsuit." "The President has been made aware that President Bush was admitted to the hospital. President Obama and the First Lady send their good wishes to the former President and the entire Bush family during this holiday season." Hours of showers on Oahu kept many inside on Monday. We presume that's what Obama did on much of his third day of vacation. He was out of sight at his vacation rental for the bulk of the day but he did manage to leave twice for two indoor activities: working out and bowling, both on the grounds of the Marine Corps Base Hawaii. The early outing was to the gym for about 90 minutes. Although this was Obama's first trip to the gym this vacation, working out is one of Obama's more regular activities. Last year he made it to the gym eight out of 15 days. In 2012, he made it five out of nine days. We'll see how he stacks up this year. The president spent the mid part of the day at the vacation home before venturing back to the base for some bowling. His bowling companions included aides and friends: Bobby Titcomb, Greg Orme, Abigail Orme, Pete Souza, Joe Paulsen and Greg Heard. As with golf, the White House doesn't release the scores or the winners or losers. This outing also lasted about 90 minutes and shortly thereafter the press pool was dismissed. Like days one and two, the only images we saw were of the president's motorcade. Those images were essentially the same as below, only wetter. 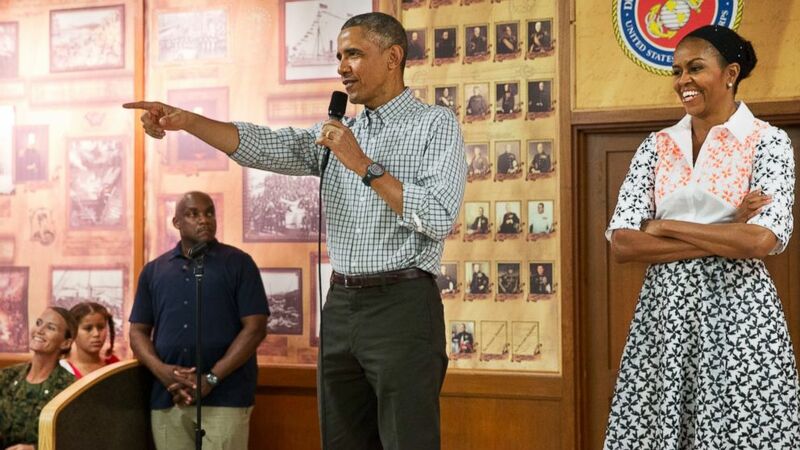 Obama's second full day on vacation brought – you guessed it – more golf. And it was the same course as yesterday, Marine Corps Base Hawaii. Then, after the links, Obama hit the beach. His motorcade wound south along the eastern edge of the island, moving from one military base to another. With family in tow, he arrived at Bellows Air Force Station, which has one of the prettier beaches on this side of Oahu, locals told us. One of the reasons the president spends so much time on the military bases here is that they offer a level of seclusion, helping keep the security apparatus from impacting the general public and avoiding the long lenses of the press. But for the press, that makes for long days with little opportunity to witness much. What the press sees is mainly through the windows of a 24-passenger bus – and mainly motorcade vehicles coming and going. As Obama golfed, we spent three hours helping keep the Starbucks on the base afloat by consuming lattes and teas while usurping all available power outlets in the store. At the beach, we had a better view, watching a Coast Guard boat armed with a heavy duty machine gun zip around crystal blue ocean waters, standing guard over the President and his party. The closest we came to actually seeing Obama was as his SUV passed the press van at Bellows beach. Some reporters say they saw him in silhouette wearing a ball cap but that wasn't captured in any photo I took. Though the press didn't actually see Obama, the day wasn't entirely news-free. For the second day in a row, the president was dealing with the murder of several police officers over the weekend. White House officials told us that Obama called the police commissioners of New York and Philadelphia to express his condolences, condemn the violence and offer assistance in the days ahead. After a short stop at home, the Obamas and friends headed out to dinner at Morimoto in Waikiki Beach. For the press? Some quality time at the Outback Steakhouse across the street and, you may have guessed it, more motorcade taillights. "I unconditionally condemn today's murder of two police officers in New York City. Two brave men won't be going home to their loved ones tonight, and for that, there is no justification. The officers who serve and protect our communities risk their own safety for ours every single day - and they deserve our respect and gratitude every single day. Tonight, I ask people to reject violence and words that harm, and turn to words that heal - prayer, patient dialogue, and sympathy for the friends and family of the fallen." President Obama kicked off his first full day of vacation in typical fashion: A round of golf. Along with White House aides—and regular golf partners—Mike Brush and Joe Paulsen and childhood friend Bobby Titcomb, the president spent about 4 hours at the Kaneohe Klipper golf club on the grounds of Marine Corps Base Hawaii. As usual, the White House doesn't release the scores. (Jacquelyn Martin/AP Photo) President Barack Obama walks with Sasha Obama as first lady Michelle Obama walks with Malia Obama, as the first family arrives at Pearl Harbor, Hawaii to begin their family vacation, Dec. 19, 2014.